Kisiwa House are very excited about their new addition to the family. In May 2014, Kisiwa On The Beach will open it’s doors and welcome guests to a sanctuary on the seductive east coast of Zanzibar. Paje is well known for it’s beautiful beaches, ideal for diving, snorkeling and for water sports where people come from all over the world to go kite surfing. You will find it in just over 45 minutes from the airport. The hotel also offers spa and wellness center facilities which is a first for the Kisiwa family. The spa an oasis of calm and relaxation offers two treatment rooms to relax and rejuvenate the body, while taking in the fresh sea air in lush courtyard surroundings planted with frangipanis, bougainvillea, jasmine and tropical flowers. The gym is fitted with the latest equipment to ensure a great workout. For those who would prefer a more relaxing break, you can take long leisurely walks on the beach past sleepy fishing villages or soak up the sun on a lounger next to the swimming pool, with an ice cold cocktail by your side while watching the canoes and dhows sail with the tide. 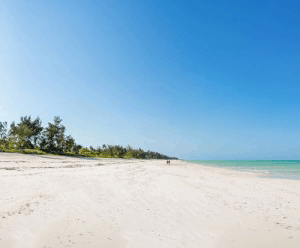 Kisiwa On The Beach truly is bare foot luxury and the best way to uncover secrets of the mystical beaches of Zanzibar.